Now woodcarving enthusiasts have a handy way to organize their favorite hobby! 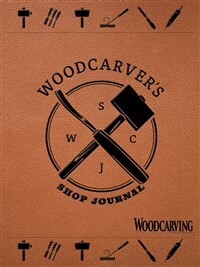 The sturdy Woodcarver’s Shop Journal features project logs, tool checklists, specialized quick-reference tables, and a handsome foil-stamped leather-look hardcover. Quiet Fox Designs is an imprint of Fox Chapel Publishing. Beautiful Quiet Fox journals include faith-based journals, zentangle notebooks, inspirational journals, and Woodstock-inspired journals. Quiet Fox journals make lovely gifts and are designed to suit every occasion, from jotting down daily errands to expressing the happy milestones of life. Other Fox Chapel imprints include Design Originals, IMM Lifestyle Books, Creative Homeowner, CompanionHouse Books, and Happy Fox Books.